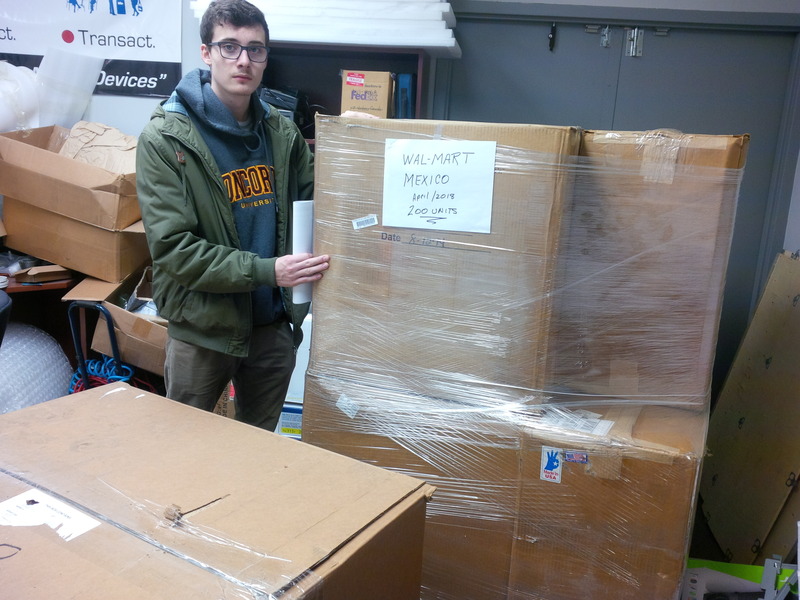 The 200 Smart Antennas and related ancillary equipment for Mexico including Walmart are expected to ship this week. A video conference was conducted earlier today with our reseller in Chile and various top level management staff and decision makers of the Chilean copper mining facility that has been appraising our SAM technology, for use within the mine. The mining application is for targeted messaging to individuals in specific locations within the mine complex. During the call it was confirmed that the mine will proceed to integrate SAM at one of its key mining locations as a first step to a complete network. Some engineering applications will be required, but aren't expected to take long to complete. Challenges have been distance, language, and the gaining of a full understanding of SAM, its technology and functionalities. We are waiting for the preparation and delivery of documents outlining the required terms, conditions and parameters. Progress at this mine will help to speed up other existing mining opportunities. iSIGN has completed its SAM video specifically addressed to schools. The video will now be part of our presentations to targeted schools and school boards, including those that we are presently in communication with. This will be the first in a series of videos designed for specific channels. Click anywhere on this post to view the video. With spring break/Easter holidays now over, presentations to various school boards recommenced as of yesterday. In addition both iSIGN and our resellers are back in touch with the schools and schools boards that had been previously contacted. iSIGN is currently preparing a brief video that demonstrates the ease of registering for SAM alerts, the delivery of messaging and our back-end. This video will be completed within the next few days and will be used in our interactions with students, parents, teachers, schools and school boards and will also be used with all other channels. Presentations to individual US airports are on-going. Conversations with the Department of Homeland Security are being held and we look forwarded to having formal in-person meetings. Our SAM technology is being introduced to 16 targeted airports throughout Mexico and follow-up discussions and meetings are being arranged. Our SAM technology, its application and integration with existing systems is currently under review by the mines' IT staff. The 200 Smart Antennas with required cables will be shipped late next week. The delay has been caused by lead times required by the supplier for the manufacture of the varying lengths of the specialized cables required. The growing number of active shooter events in the US since 2000 has raised the overall awareness of such attacks. Between 2000 and 2006, the average number of incidents in the US per year was 6.4, which increased to 16.4 between 2007 and 2013 (a 2014 study by Texas State University, the FBI and the US Department of Justice). Insurance programs for ‘active shooter’ situations generally covers the use of any weapon – firearms, knives, explosives, corrosive substances, etc. While coverage has been around since at least 2011, a growing number of insurance companies have launched programs since 2016. ‘Active shooter’ insurance covers the liability that an institution or corporation has if they are found to have not taken the needed precautions to prevent rampages. Costs such as victim lawsuits, medical costs, trauma counselling and legal fees are covered by such insurance. As part of iSIGN’s promotion of its Security Alert Messaging (SAM) technology, information packages have been forwarded to top insurance company underwriters as a perfect companion product piece to their ‘active shooter’ insurance protection. Additionally, in our conversations with schools and colleges we are promoting SAM’s ability for possible premium reductions to their ‘active shooter’ and other dangerous event insurance policies. Initial responses have been positive. iSIGN is presenting SAM security to the March for Our Lives participants. March for Our Lives is a student-led movement to end gun violence in the United States. On March 24, the students, families, and supporters of March For Our Lives will take to the streets of Washington, DC to demand that their lives and safety become a priority and that we end gun violence in our communities and schools today. There are also nearly 600 sibling marches being planned in every state across the country and around the world. Our offer to install our SAM solution at no costs into Marjory Stoneham Douglas High School has been referred by the school board to the appropriate party. Additionally, we have completed and submitted their requested Vendor Registration Application. Being accepted as an approved vendor is a requirement for presenting our technology to the school board for potential sale into their 310 schools and education centers, with approximately 270,000 students. The revenue potential for iSIGN, based on an annual fee for each student, staff member and parent that are registered for each school. iSIGN’s revenue potential based solely upon 270,000 students and one parent per student, would be in excess of $10.8 million US annually. As previously released, SAM discussions were held with the appropriate parties of the Mt. Vernon Middle School and Mt. Vernon School Districts during the week of March 5th. During the lengthy meeting, SAM features were reviewed, including, the many ways that messages could be received: SMS messages, email, mobile app, phone call; the ability to use SAM for non-emergency messaging (pep rallies, school sporting events, etc.) the ability of SAM to be linked to first responders and parents. Of great interest was the fact that our SAM solution is hyper-local, meaning that the ability to control the system and send messaging resides with the individual school unlike other alert systems. The cost for the system was discussed in generalities as being an annual fee based on the number of students, staff and parent that register for each school. At the request of the school district representative, the previously arranged demonstration, is being rescheduled to allow for a selected number of students, staff and possibly parents to register to receive test messages from us. The demonstration will be arranged for after the spring break. Additionally, it was requested that a ‘stress test’ of the SAM system be arranged. This will involve the full student body and staff registering for messaging and test messages being sent to demonstrate the speed with which messages are received. The Mt. Vernon School District has six elementary schools, two middle schools and one high school. The overall number of students within the district is currently unknown by us, thus preventing us from providing an annual revenue estimate. Our reseller, Rich Multimedia Technologies, today met with representatives of the Orange County Department of Education and Orange Unified School Districts. This meeting stems from the introduction of our SAM solution at the March 6th security information session entitled “Active Shooter Response Presentation for Parents”. The purpose of today’s meeting was to provide an in-depth presentation on SAM, its various features and capabilities. The meeting ended positively and the next step is to present to their IT, Risk Assessment and Maintenance departments for integration discussions and to student/parent committees for registration purposes. The Orange County and Orange Unified School Districts have approximately 40,000 students. iSIGN’s revenue potential, based solely upon 40,000 students and one parent per student with an estimated annual registration fee of $20 to $24 each, would be approximately $1.6 to $1.9 million US annually. The Chairman of the school district flew into Toronto to meet with us at our offices on March 8th, along with their insurance representative to gain an understanding of SAM for eventual presentation to their 5 distract schools. This presentation is scheduled for March 19th, for integration into their 5 district schools within the Clearwater area. There are 45,000 students enrolled in these five schools. iSIGN’s revenue potential, based solely upon 45,000 students and one parent per student with an estimated annual registration fee of $20 to $24 each, would be approximately $1.8 to $2.2 million US annually. The potential for iSIGN's SAM solution, is that there are 180 additional Christian Schools districts. The overall school channel is massive, with 75 million students in the United States alone. Our next step is the Christian Church networks at missionamerica.org, which is equally impressive with over 90,000 Christian churches and its members looking for a safer environment with the SAM solution. 200 Smart Antennas are in the process of being readied for shipment to Rich Multimedia technologies for use in Mexico, including Walmart stores, and US airports. Units will be shipped during the week of March 19. Bell Canada recently publicized an emergency alert system similar to the one responsible for the nuclear false alarm in Hawaii. We thought it would be valuable to understand how iSIGN’s SAM system would work with Bell’s offering, and how it contrasts in features. The Bell system is not local enough and not wide-area enough. Stuck in the middle, the Bell system will alert people in a town or city, but not focused enough to address a building or campus. For example, you can receive tornado alerts for a city or county, but it is not set up to deliver alerts about the situation on a campus or stadium or hospital. You will also not receive messages that would impact a family member who is far away or travelling or in another state or province. As an illustration of range, the AlertReady system reaches a band between 30 and 300 miles, not less than 30 miles and not over 300 miles. These numbers are not accurate, but are intended to illustrate the limitation of being stuck in the middle of a band. An exception is Federal Government alerts that may be broadcast country-wide. Compare this with SAM’s reach from 30 feet to around the world, making SAM’s coverage effectively unlimited. It is also worthwhile to note that SAM works where there is no cellular coverage. The AlertReady system is administered by government officials, whose committees decide on the type of warning that is required based on pass-along information reported from remote sources, similar to the system recently activated in Hawaii. In contrast, SAM is administered locally by the facility owner/operator, so alerts are based on firsthand access to information and instantly delivered. Alerts will be specific and accurate based on the near proximity, and able to be rescinded or cancelled immediately. Only the federal, provincial and municipal governments have access to AlertReady for government approved alerts. The most frequent alerts you would receive would be from Environment Canada and Climate Change Canada. Who gets in the way? The AlertReady system required information be two-stepped through different media organizations to activate the alert. It is a rather confusing coordination of responsibilities and tasks similar to the Hawaii incident. Aside from the few phones capable of receiving the alerts, the messages would be relayed to radio, TV, cable & satellite and websites for rebroadcasting, but the individual re-broadcaster can decide whether they want to rebroadcast the alert. For example, a campus radio station would be required to re-broadcast a climate change warning for the country, but not a report of an active shooter on the same campus. AlertReady is only capable of reaching a very limited number of devices. For a device to receive alerts, it must be LTE/4G, AND have WPA capability, AND be on the cellular network. The list of phones that will work currently with AlertReady is 13, and Apple is not one of listed capable phones. This limits the effectiveness of the system dramatically. In several years (3 to 5) the AlertReady system will be receivable by 60% of the population. The 13 phones listed include 1 Alcatel, 1 Blackberry, 2 Huawei, 2 LG, 1 Sony and 6 Samsung phones. It also has some unusual limitations. For example, if you are on a phone call, or using data for some function, AlertReady will not interrupt your activity until you end the call, leaving you unaware of the danger. Also, if you miss an alert, and the alert is cancelled before you are able to receive it, you will be unaware. This is problematic in situations like a flash flood, where if you are away, you would not know your house had possibly flooded until you return home or are informed by someone. SAM reaches nearly every phone. That would include LTE, 3G, CDMA, GSM or any phone that is still capable of receiving SMS text messages. In addition, the alert methods that SAM delivers that AlertReady does not includes WiFi, Bluetooth, BLE (beacons), Digital Signage screens, text to voice, social media and the SAM app. And for older phones that are still in use, SAM’s Bluetooth Push system provides coverage through the Smart Antenna. It must be understood that even though AlertReady is using the cellular LTE system only, it is not really a cellular telephone feature. Cellular telephone would normally make a one to one connection with your phone number. AlertReady is a broadcast using a special method, so similar to talking on a CB or HAM radio, it broadcasts to everyone in range without ever knowing who received the broadcast. Like listening to AM radio in your car, you can be anywhere within broadcast range and nobody will be able to find you or even know if the broadcast was received by anyone. The SAM system can localize phones, so that if the phone’s user were incapacitated, they could be rescued. SAM alerts can go out to everyone, or to just a selected group based on any combination of characteristics. AlertReady is a decent accessory to add to SAM. It would be especially helpful to those interested in climate change alerts, since it is not likely that any SAM operator would have a reason to send out an alert about a melting iceberg or wildlife habitat impact. But remember, to receive the AlertReady messages, you must have one of the 13 phones currently listed.